Chances are that you have watched or at least heard of Dancing With The Stars. It is one of my favorite shows that follows the weekly progress of a "celebrity" with their professional dance instructor competing against more of the same. Each week one couple is eliminated until a champion is crowned. Unlike some reality shows where the winner walks away with a mega prize, the Dancing With The Stars winner goes home with a Mirror Ball Trophy. I watch with anticipation week after week pulling for my favorite and wishing I were in their shoes...dance shoes. The next season of Dancing With The Stars starts in March on ABC. With no celebrity status of my own, being on the show would be impossible. However, I do love to dance, take lessons and compete in Country Western Competitions. I have worked hard at learning the techniques and skills to do well so far. Many times that involves getting lessons from a variety of instructors. I have a regular instructor who I take lessons from and dance with at competitions. When I heard that Dancing With The Stars Pros Edyta Sliwinska and Alec Mazo were going to be offering lessons at a studio near Houston, I decided to go. I wanted some extra help with my Waltz and Cha Cha. 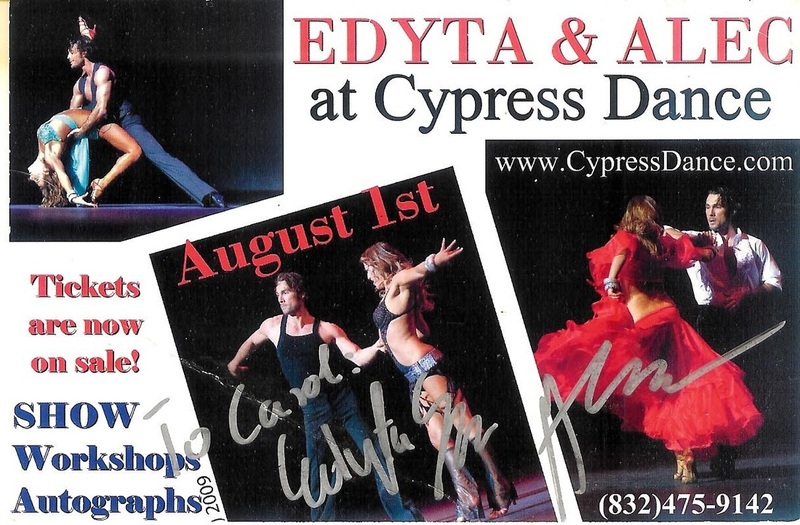 Each day before we got started, there was a meet and greet with Alec and Edyta. It was not limited to dance students, but open to all their fans. First expecting a hollywood snob, that was not the case. My family thought they presented themselves as any other of my dance friends or instructors do. They visited, sweated and used the same restrooms as us. The first day was for group classes, forty-five minutes each with about 35-40 people in each class. They focused mainly on styling in the Rumba and Cha Cha. That was great for me, I needed both. I don't compete in Rumba but it is similar to the Night Club 2-Step that I dance in Country Western. There were all ages and levels of dancers in the classes. I suppose they were just as interested as I was in hearing what the Pros from T.V. had to say. At first I thought it was a little rude, but wrote it off as I know something that he doesn't , when Alec made a remark about my boots. In Country Western Competition we are required to dance in boots. It was nothing unusual to me wearing them for lessons. Maybe he didn't realize that they were dance boots. Not the Saturday night kind, but a special made dance boot. I believe it was the following season of Dancing With The Stars, when they made an attempt at the 2-Step, that I saw the girls wearing boots. There's not much way to tell the difference in boots just seeing them on television. So not too long ago, I was looking on the Evening Star Boots web site and saw that they were indeed wearing the dance boots. So now they know. The next day was reserved for private lessons with either Alec or Edyta. I booked with Edyta in order to look at things from a woman's perspective. I believe in doing that and I learn from other women as well. As wonderful as my male instructor is, he realizes that he can't demonstrate some feminine points as well a female instructor can and encourages me to take lessons from others. At the beginning of the lesson, Edyta and I discussed what I wanted to work on. I had booked 2 hours with her. Knowing that I can use help on many things, I limited my time with her to working on my Waltz and Cha Cha technique. I can follow well and know many patterns used in these dances. Since I dance in competitions, there is more to it than just dancing, I wanted to get some finer points on making my arm lines look prettier in the Waltz and improve the latin motion in my cha cha. I was a little surprised when she told me that she doesn't lead, meaning that she would have to dance as my male partner. We worked around that by starting in the middle of a pattern that was basically the same footwork for either person but with her starting on the left foot as a leader would do. It worked out fine. She allowed me to have my granddaughter and niece video the lesson so I could study it more later. I am that way, going back over every word and every step practicing at home. Overall I thought the classes and private lessons were great. It will be a while before I can afford to take lesson from someone with their credentials again. The classes weren't so bad at $40.00 each but the private lessons were very expensive. $$$$ Maybe it was because they were traveling and not at their regular studio. It was all worth it though. I feel like I learned something from Edyta. Not long after taking these lessons, I went to California to compete and did well against the others in my division. The video is from that competition and is my newcomer year waltz with my pro.